When a map to a long-lost pyramid is discovered, only the greatest adventure hero of all time can unlock its mysteries — Illinois Jane, cartographer extraordinaire! 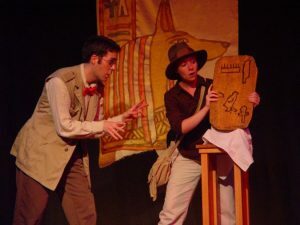 But the evil French villain Pierre LeMalodeur steals the ancient tablet from Illinois Jane’s father’s museum. Illinois Jane and her sidekick, Sid, must stop him and his French henchmen (Marcel the Mime and Claude, who has more lives than a cat) from reaching the pyramid first and stealing the secret to immortality. Along the way, Illinois must brave booby traps, face burly pirates Captain Nobeard and Tintoe, and fight off Pierre’s henchmen on top of a moving train (don’t worry, the staging is a snap!). Meeting every challenge with style and panache, Illinois Jane rushes to the rescue in a harrowing climax as she matches wits with LeMalodeur in the heart of the Pyramid of Peril. The following sound effects may be used without charge by anyone producing an authorized production of Illinois Jane and the Pyramid of Peril. For any other uses, please contact T. James Belich.